This small cosy place, is located in a lively and safe environnement. For people who desires not to cook all kinds of good restaurants are in the area and for ones who like to cook, there is the well known marché de la rue Poncelet with fresh fish, meat,vegetable, fruits. Mijo was a pleasure to work with. I stayed for a month in this cute apartment set back from a busy street. Ideally located close to two metro stops for quick access anywhere. It also has lots of the necessities close by: market, wine, butcher, chocolate, etc. The apartment inside feels like home: the kitchen is larger than most Parisian kitchens: induction three burner stove, oven, dishwasher, and quality cookware. The best was comfortable! The new washer and dryer is the only combo machine that has ever actually gotten my clothes dry. Plenty of room for storing your belongings too. I highly recommend this apartment and will be back myself. Oh Victoria such a delightful appreciation so glad you enjoy both Plan and area. Thank you for having taking care so well of my parisian n'est. L'appartement est bien situé, à 10 minutes des Champs-Elysées et est entouré d'excellents restaurants, commerces de bouche et autres magasins. Il est confortable et spacieux, la cuisine est bien équipée, et il est très tranquille. Enfin, la propriétaire est prévenante et sympathique. Une adresse à retenir. Madame Borde est très bienveillante, car son séjour s’est passé pendant les manifestations des Gilets jaunes. Beaucoup de chance d’avoir une locataire si patiente! Our apartment in Paris was just what we hoped for. Very comfortable and fully equipped. Our host was extremely helpful in providing information about the neighborhood. All services were minutes away - market, bakery, restaurants. Close to metro & bus stations for easy access to all sites. At the end of the day, after miles of walking, it was great coming back to our home away from home. Thank you very much for your kind appreciation. It was a pleasure to meet you and I am glad you enjoy both the place and the environment. Thank you so much for taking care of the apartment...and flowers ! 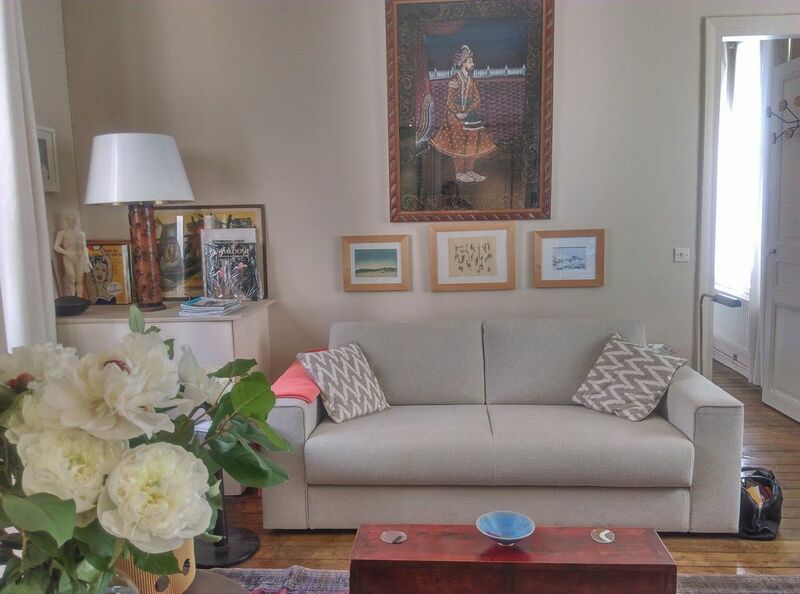 Mijo's place could not have been better--beautifully equipped and decorated, location unbeatable, two minutes to the Metro, walk to Etoile, many excellent restaurants with a few minutes walk, great neighborhood. The best part: once inside the door from the street you are in total tranquillity! We have stayed in many Paris apartments before, but never one so calm and peaceful. And Mijo was most helpful with our questions. Living room and bedroom nice and roomy. Thank you so much for your kindness. I always try to do my best even when I am not in Paris to welcome myself the residents of my home. Thank you for taking so much care of my belongings. It was a pleasure to meet Paula. Thank you Paula for having taking care of my flowers. Cozy Apartment in Great Location! The one bedroom apartment was very cozy for the two of us. The location couldn't be better! Close to two metro stations, bus stop, restaurants galore, grocery store and assorted shops for cheese, wine, bakery, etc. The owner was wonderful! She contacted us several times before we arrived to answer questions. She had information on Paris in the apartment. The bed is the same as most European beds that is two singles pushed together. The washer and dryer came in very handy and we used them frequently. It took us a while to figure out how to use the appliances and heat but we are silly Americans. We did not find air conditioning on some rather hot afternoons but we opened the windows and were able to get a nice cross breeze. The apartment is very small but very comfortable. There are a lot of the owners things in the apartment so it is a bit cluttered and many of the cabinets are locked but honestly with the location being so convenient we were seldom there. Thoroughly enjoyed staying at this apartment and would highly recommend! I know how frustrating it is not to know how to use appliances despite the notes left in English for how to use them. I will make better informative notes, for the washing machine, and where to find the vacuum cleaner. 10mn walking to Air France shuttles to Roissy and Orly. Taxis and Public transportation right on the spot. The apt is on rue du Faubourg Saint Honoré, and within walking distances to restaurants, boutiques, bookstores, theaters, concert hall. For joggers beautifull Parc Monceau.